A hidden gem no more... Sleeping Bear Dunes National Lakeshore made CNN Travel's list of 20 can't-miss-U.S. beaches, and has also been named "The Most Beautiful Place in America" by the viewers of ABC's Good Morning America. The pictures you've seen do not even begin to describe the splendor of this natural wonder formed by glaciers and located within Leelanau and Benzie counties in northwest Michigan. Boasting 35 miles along Lake Michigan, two islands and 21 inland lakes, this national park brings in over a million visitors every year. 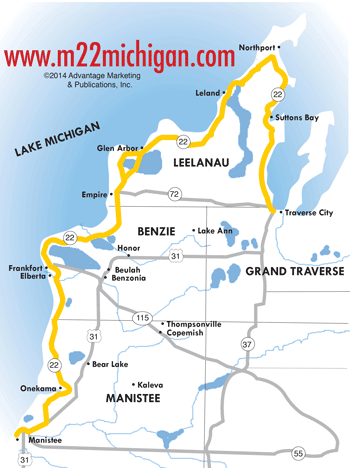 A tour along the famous scenic Highway M-22 will bring you right up to the national park. The sand dunes that peak at over 400 feet offer spectacular views over the lake and neighboring communities of Empire and Glen Arbor. The unusual name stems from the Ojibway (Chippewa) legend of a sleeping bear and her two cubs who were driven into the lake after a forest fire on the western shore of Lake Michigan. Once the mother bear reached the Michigan shoreline, she discovered her cubs had disappeared. The Great Spirit was moved by her loss, and had her fall asleep at the spot that became Sleeping Bear Dune. The North and South Manitou Islands mark the spot where the cubs perished. The national park was officially opened on October 21, 1970. Named for the long serving Michigan senator who lobbied tirelessly for establishing the park, the Visitor Center is located on M-72 just east of Empire. This is where you will want to begin your visit...exploring the exhibits and dioramas which showcase the history of Sleeping Bear Dunes. Staff is available to answer questions, and you can pick up brochures and maps that will help guide you through the park. The Philip A. Hart Visitor Center is open seven days a week from 8am-6pm Memorial Day through Labor Day weekend, and 8:15am-4pm the rest of the year. They are closed Thanksgiving, Christmas, and New Year's Day. This is a must-see for any visitor to Sleeping Bear Dunes National Lakeshore. Pierce Stocking was a lumberman who loved nature...especially the view from the bluffs. He wanted to share this beauty with the public, and began construction of a road in the 1960s. By 1977 it became part of the National Park. The Scenic Drive starts north of the Visitors Center and is off M 109. Along the seven-mile drive, you will be treated to some of the most beautiful sights one can imagine, including stunning views of Lake Michigan. Drive or ride your bike (expert level cyclists only); there are two picnic areas available with restrooms. You must stop at the Lake Michigan overlook (at parking lot #9) and walk to the observation deck, which sets 450 feet above the lake level. This is the greatest view of all, so plan to spend some time here and enjoy the serenity of this majestic place. The Dune Climb is eight miles north of Empire off M 109. Only for the most physically fit, climbers are rewarded at the top with views of Glen Lake. There are three hiking trails in this vicinity which offer various degrees of difficulty...Dunes Trail (3.5 mile difficult), Loop Trail (2.8 mile moderate) and the Duneside Accessible Trail (1.8 mile easy) with is handicapped-accessible. Opening in 1901, the Life Saving Station was moved to its present location just west of Glen Haven in 1931 due to sand dune encroachment. The Maritime Museum opened in 1984, and visitors can learn about the history of the U.S. Coast Guard and shipping on the Great Lakes. Exhibits and re-enactments give you a real "feel" of life back in the early 1900s. The museum is open daily 11am-5pm Memorial Day weekend through September, and Saturdays and Sundays from noon-5pm October 1-16. The North Manitou Island is roughly 7.5 miles long and 4.25 miles wide with 20 miles of shoreline. It is a destination for campers, hikers and backpackers...with no motorized vehicles allowed. The solitude of the island is perfect for those who enjoy watching birds, wildlife, and discovering the variety of plant life. Very few people inhabit the island. South Manitou Island has a bit more to see...including a lighthouse, shipwreck, and Coast Guard Station. Ferry trips to the islands are arranged through the Manitou Island Transit, which leaves Leland, MI every morning and returns in the afternoon during the summer months. Reservations are recommended. A motorized tour of South Manitou Island is also available. This is truly one of Michigan's most treasured spots. 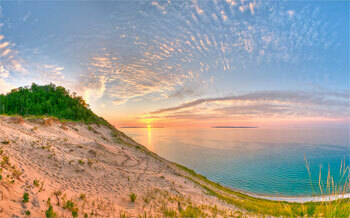 Plan your summer or fall trip to the most beautiful place in America...Sleeping Bear Dunes National Lakeshore. Discover more Sand Dunes to explore around Lake Michigan!